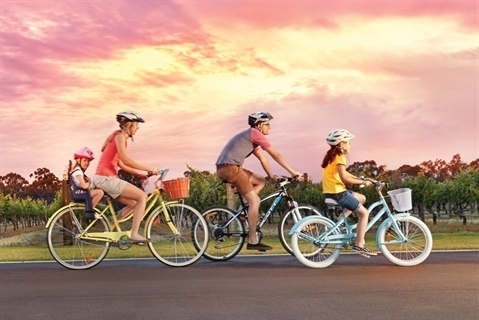 This Autumn, The City of Swan is once again hosting their popular 'Bike in the Valley' family-friendly community cycling event through the beautiful Swan Valley. Held on Sunday, 28 April 2019, the ride is suitable for all ages and fitness levels and will start and finish at Lilac Hill Park, West Swan Rd, Caversham. Registration opens at 9am and the ride will commence at 10am. Families can choose from 3 routes: a short 8 km route, a medium 20 km route and a longer 30km route. All routes are well signed and supported by a 'sag wagon' which will follow the riders. Marshals will also man critical corners and crossings. The rides are mostly on bike paths and quieter back streets. Please note that there will be no road closures and all normal road rules apply, including the wearing of helmets. Bring water to drink on the ride. After completing your chosen route, you can tuck into the fundraising sausage sizzle or bring your own gourmet picnic along. This is a great activity for families, friends and workmates, so come along and enjoy a leisurely ride through the Valley on a balmy Autumn Sunday morning. There will also be plenty of FREE parking on site. The event will go ahead rain, hail or shine. No late starts. Bike hire is available from Brookleigh Bike Hire 0401 077 405 (phone to book in advance). For more information on this great FREE community event, please visit the City of Swan website. What is the Best Bar in Sydney?